Kendall Bohn is a professional artist who lives and works in Minneapolis, Minnesota. Kendall Bohn fine art paintings and sculpture are permanent features in worldwide collections including the Fredrick R. Weisman Art Museaum, North Dakota State University (Fargo) and Yale University. Bohn works in 3D and two-dimensional traditional media as well as drawing fantasy and abstract coloring book art freehand. His sculptural media include works in marble, clay, sandstone, wire and metals. He paints in both oils and acrylics and designs decorative tiles. In additional to commissioned fine art pieces, Bohn is the artist and publisher behind a popular series of abstract and fantasy art coloring books for adults and children. 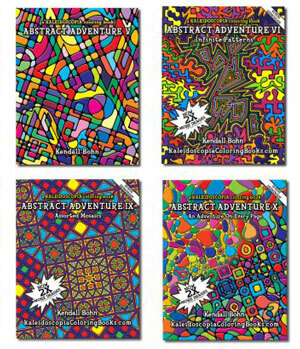 His Adventure series coloring books are filled with wonderfully imaginative abstract and realistic drawings rendered in black and white. These wonderfully creative adult coloring books plus sample printable coloring pages are available at kaleidoscopiacoloringbooks.com or at Amazon. Kendall Bohn's Kaleidoscopia Coloring Books are a creative joy to adult colorists, older children and designers who appreciate unique abstract designs and fantasy line art. Each beautifully detailed coloring page is filled with hand drawn pictures meant to be colored in. His drawings are the ultimate in advanced coloring designs - they appeal equally to kids, teens and adults of all ages. There's an element of fantasy to each coloring picture that pulls you into the drawing even before you begin to add color or texture. Kendall Bohn's kaleidoscopic designs and abstract coloring pages are my favorite coloring books for adults. All coloring books produced by Kaleidoscopia present each volume as a collection of related artistic pictures with a topical theme designed to be colored in. The pages all are works of art to enjoy by themselves as well as a set. These beautifully rendered drawings appeal to all ages - children, teens and adults. 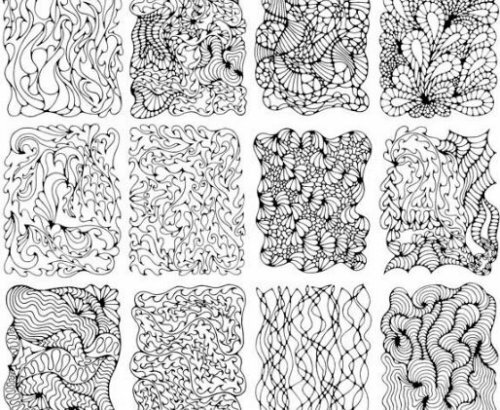 Anyone who enjoys coloring as an artistic hobby or for relaxtion will enjoy Kendall Bohn's coloring books. Not only are the pictures unique and relaxing to color in, they're equally worthy of framing as works of art, either embellished with markers or colored pencil or simply mounted and framed as black and white prints. They're that interesting and beautifully drawn. 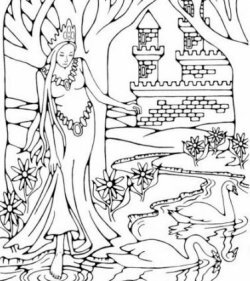 The coloring pages in each book embrace a single topic such as undersea creatures, prehistoric beasts and scenes, fantasy butterflies and dragonflies, decorated alphabet letters and medieval fantasy imagery. Bohn has more recently published a series of mandala designs for coloring. All Kendall Bohn Adult Coloring Books I've reviewed are rated G so the drawings are suitable for colorists from about 10 years or older, but I find them particularly appealing to teens and adults looking for challenging, complex coloring pages with difficult designs. Kendall Bohn earned a Fine Arts degree (BFA) from North Dakota State University in 1989 and served a sculpture apprenticeship in New York following graduation. He now works in studio space located at the California Building in Minneapolis where he owns and operates Kaleidoscopia Coloring Books. 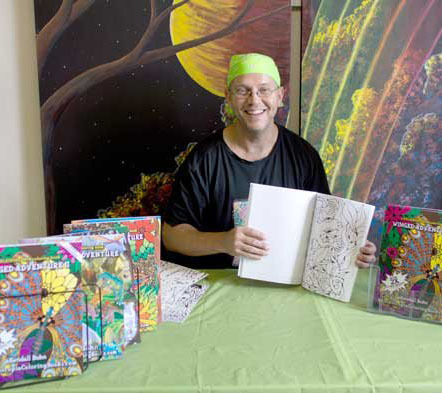 Kendall Bohn's best known adult coloring books include Alphabet Adventure: A Kaleidoscopia Coloring Book (Volume 1) published in April, 2012, Mandala Adventure: A Kaleidoscopia Coloring Book (Volume 1), released in November, 2012 and Mashup Adventure: Technorganic Patterns (February 2013). Alphabet Adventure: Volume 1 features two versions of each letter page: one filled with design shapes both inside the letter boundaries and in the background, and one with the background left blank. Mandala Adventure is a double book, with 108 pages, 52 uniquely beautiful mandala coloring pages for adults, designers and older kids or teens while Mashup Adventure is a collaborative effort between Kendall and his editor. It features two versions each of 26 complex designs to color, in combinations that are both organic and high tech. Browse the recommended selections of affordable and creative coloring books for sale in our on site shop.